Image by PeapodLife: Your Quality of Life wants its Perspective Back. We’re not the first to talk about downsizing your lifestyle, and we certainly won’t be the last. From The Huffington Post series by Julie Kantor to an article on Scaling down a retirement lifestyle by Sonya Stinson on Bankrate.com, many smarter and more eloquent individuals have expounded on the many virtues of downscaling your lifestyle. And while Julie and her family moved into a rental apartment, we at PeapodLife don’t necessarily believe one has to take such drastic steps to achieve the same goal. On the contrary, we have what we believe to be a unique take on the whole downsizing your upscale lifestyle to a LIFE OF SUBSTANCE. But let’s say you do sell? You still have to buy another home. How will it be different? Also, what will you do with the excess cash? Where will you invest it? So long as you’ve lived in your home a number of years there’s no capital gains, but there are important financial considerations to make. What if you could live in a green dream home and build 9 more like it for others to live in? You could sell them, rent them, or let PeapodLife’s Property Management Partners manage them for you. You’re still invested in Real Estate, but no longer tied to a single enormous house you don’t need. Instead, you’ve diversified your real estate investment and are helping lower- and middle-income families also live in healthy green dream homes with PeapodLife ecosystems. So, let’s be practical and walk through PeapodLife’s process step-by-step complete with some numbers. To keep it simple, we’ll work with a net house value of $2.5 million (after all real estate commissions and fees and any mortgage balance outstanding on the property; this is a fair number in today’s Toronto market for an upper-middle-class home). 1. Get pre-approved for 10 mortgages of roughly $1 million each ($10 million total). 2. 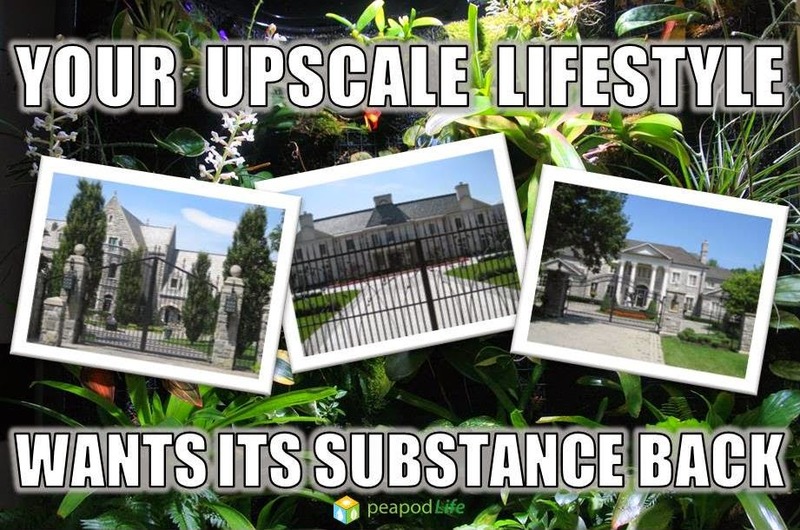 PeapodLife’s Affiliated Realtors locate 10 “sub par” properties (fixer-uppers) with one in a desirable neighbourhood you wish to live. All 10 (or just 9) can be selected on the basis of being able to be turned into duplexes with legal 2nd Suite Basement Apartments (income properties). Conditional offers are made on the properties. 3. PeapodLife’s Affiliated Architectural Technologists Inspect Homes, plans changes, prices out improvements including cost of high-order rainforest ecosystems on all 10 properties. Each property, cost of home + green renovations including ecosystem comes to less than $1 million. 4. Close on homes; roughly $250K downpayment on each ($2.5 million total, or cash on hand after sale of upscale home). 5. 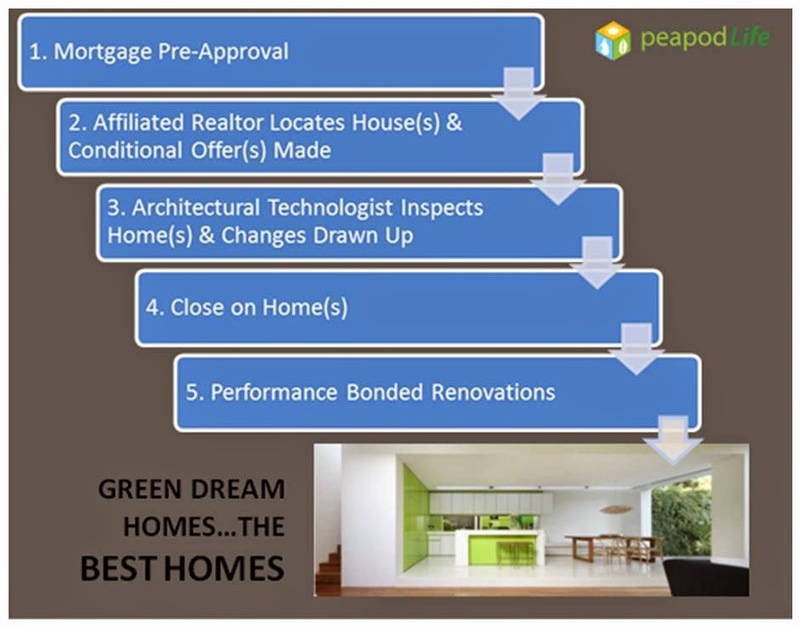 PeapodLife Affiliated Performance-bonded Contractors do the renovations & PeapodLife installs ecosystems. • You are now the proud owner of 10 sensibly designed Green Dream Homes, 9 of which are income properties, all of which feature the healthiest, most vibrant, beautiful and stress-free living environment imaginable: PeapodLife BEST HOMES…Building EcoSystems & Technology via Home Ownership for the Masses that’s Economical & Social. • You can rent, sell, or gift to your children any of the 10 BEST HOMES…whatever you choose. But make no mistake: you’re the hero here: you’ve transformed 10 run-down old houses into 10 green dream duplexes, all with legal basement apartment dwellings unlike anything else in the GTA. So long as you can carry the mortgages, you can wait for bidding wars to break out on any of the properties (which is not unheard of in today’s market). In the meantime, you can hand over the Property Management to PeapodLife’s Real Estate Partner and either earn an income (or at least carry the mortgage). Or, if you want a real life of substance, you can price the homes fairly (which still gives you an R.O.I. of $125K per house, or 50% ROI) and give 18 families (9 x residences) access to affordable green dream homes, knowing you’ve helped rejuvenate aging buildings in Toronto, and progressed the Green Building Movement. No matter how you look at it, it’s a win-win-win. No matter how you slice it, you’ve downsized into a life of REAL SUBSTANCE, with the healthiest, stress-free living space for you, and for 18 other families in your community. Email us today to get started: info@peapodlife.com.